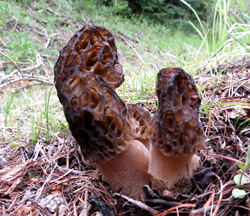 There is simply no other way to describe our May 30th mushrooming foray on Mt. Hood! Late Thursday morning we decided to drive to one of our favorite morel locations on Mt. Hood. Although we always try to think positive, we weren't really anticipating a very notable collection of mushrooms. After all, it had been raining for days, and this was the first break in the weather for some time. When we spied morels growing along the road, we were delighted. When we quickly gathered over a hundred morels, we stopped counting! We'd never seen so many morels in this location or any other location on Mt. Hood before. There were both black and blond versions, both tall and short. And, all of them absolutely perfect! What a great gift from the forest floor! Steven has a saying, "Even a blind hog gets an acorn every once in a while." On this day, we got acorns! We encountered all sizes and shapes of morels. I ENJOY wild mushrooms, but I happen to like ordinary white button mushrooms, too; the cultivated kind, the ones that are also called champignons de Paris (especially by the French). Simply sautéed in a little butter or olive oil and finished with garlic and parsley, or sliced raw for a salad with a lemony dressing — what could be better? They’re completely satisfying. 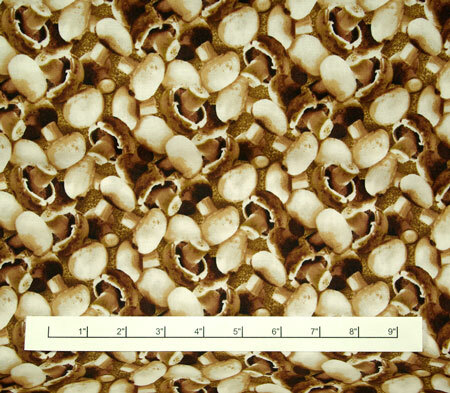 celebrates the lowly, common button mushroom.